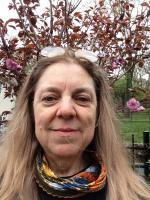 Martha Jackson Kaplan is a Pushcart nominated poet and flash fiction writer who lives in Madison, Wisconsin. She has a passion for history, a sense of place, and language itself. She has published both in print and online and has won awards from Wisconsin Fellowship of Poets. You can find her flash fiction at Bending Genres II, an essay in Bramble V (online and in print), and is thrilled to be published again with Unlikely Stories Mark V. More about her can be found at MarthaKaplanPoet.com. "Lines Hallucinating Stoned Ladders Walking in Circles" and "Ladies Night at Cafe Trauma"
​wind eyes to air their there. "Transgressions," "Kaddish in Bones: Yahad in Unum," and "Sallow Surge Rising Manhattan"
It is true what the priest discovered. I have heard others tell of it. The bones of Jews have been ground into the road to the green cemetery tended for the SS graves. "What to do with thread in Texas or the meaning of string," "Night work in Texas," and "W.T. Talks Hard Time in the House"